So I recently bought a 28degree Randal truck baseplate for my Caliber trucks. 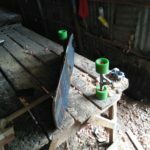 I wanted to have more stability in the back so I could skate bumpy roads, smooth roads and still have a lot of lean and use barrel bushings in my back truck. When I got it though, I found that it had only old school mounting holes. Which was annoying because all my boards had mostly new school holes as most trucks these days have those. So I needed to solve that issue. Read on below to see how I redrilled the holes. Do I need a 28 degree plate? How did I go about redrilling the baseplate? Yes I do. I like to have a setup that has low resistance and feels soft. With a symmetrical setup, that’s a bad idea and it will be easy to get wobbles at speed. So it makes sense to go for a lower plate in the back to get more stability whilst maintaining that overall soft resistance. Fortunately, Caliber trucks are compatible with Randal baseplates so I was able to buy a 28 degree Comp ii plate from Sickboards. 35-degree plates are also available but it felt sketchy for me when I tried, it still felt too twitchy and responsive because the bushings were too soft at the back (or the plate was too tight). (Update, I’m now skating the 35° cause the 28° is too dead and too stable haha). I recommend you get a Randal plate and do the same if you want a soft and leany setup or just a setup that is more stable. That being said, I do hear that with tall bushings you can have hard bushings but still have a lot of lean. I’m yet to try a tall bushing truck but I think it might be better. 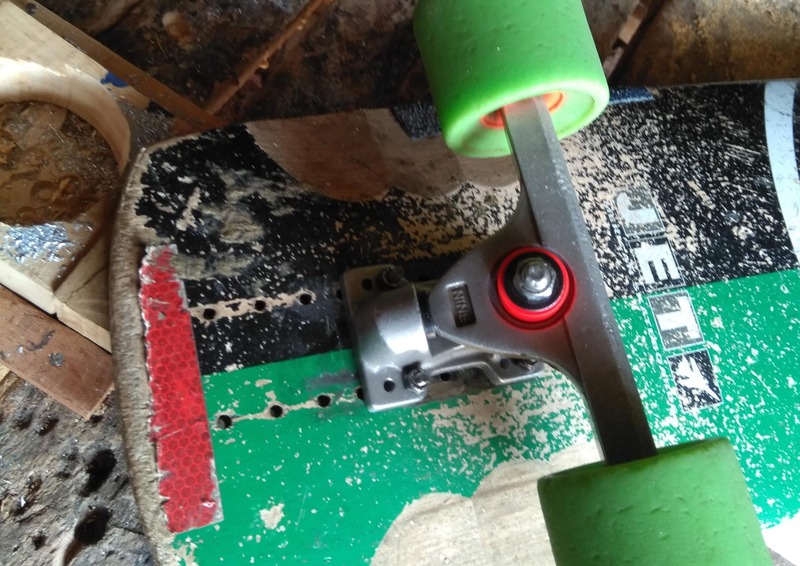 Having hard bushings means more stability and more lean means better sliding (imo). My first precision truck will be tall bushings truck. I have my eyes on Valkyrie voxters cause I don’t like the other options with rake. The Comp ii luge plate only has old school holes. I needed to redrill new school ones. Started by screwing the Comp ii baseplate to my other 35degree baseplate. I did this so the new school holes could line up correctly on the baseplate. So after this, we started drilling with a small drill bit just to break ground (or baseplate) and make sure we were doing this accurately. We then used a bigger drill bit and expanded the holes. A pretty simple process. It’s important you get the holes right because if they are misaligned you won’t be able to mount your trucks correctly, or even if you have mounted it the truck could be sitting diagonally instead of straight. So you run that risk of your trucks not lining up correctly. You need to be careful. One problem I run into is where the new holes were mounted. The hole on the left will only take a nut if you place the nut upside down otherwise the structure support will get in the way. 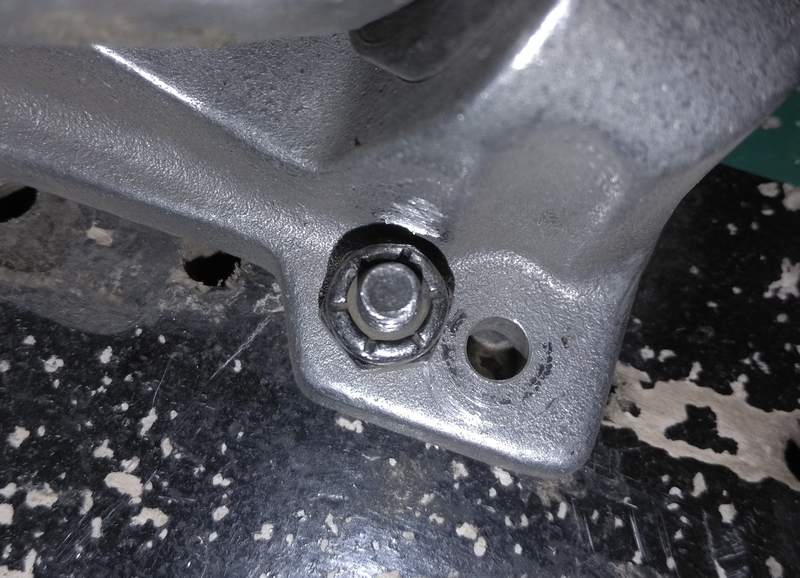 Any hole you make on the right won’t have enough clearance either, as you can see, the current hole has a cut out to facilitate the nut having enough space and for any skate tools you use to tighten it. A second hole will allow the nut to sit but you won’t be able to get your skate tool round it as the pivot will get in the way. You can still tighten the nut and you’ll be able to live with it. 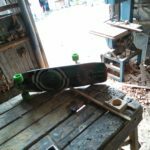 Check out my nuts below (hehe), you can see clearance for the old school nut on the right and even see the arks my skate tool made when I was using it on the new school nut. Thanks to overcoming that small hurdle I now have a stable and soft downhill setup. I have it on 44* 85a/85a bushings upfront and 28* 93a/90a bushings in the back. It fit perfectly with the existing Randal pivot cup. I’m happy with how it feels, how it turns and how it slides. I get a lot of lean but the setup is still stable. It leans a lot and I went to this spot that is kinda fast and really bumpy and it felt solid and stable. I need to experiment more and find the limits of this setup. For sure if I had rushed the process I would have messed up my plates and had to redrill my board and make it look ugly. I highly recommend the luge plate if you can get one. A cheap way to get a lower angle truck at the back. Shoutout to the #WhatgearIshouldbuy group for giving me ideas on how to do this.